It’s that time of the year when underdogs get to rub shoulders with top teams in the country! Most fixtures look like bankers but there’s plenty of value in backing amateur teams to beat those who compete in the elite league and putting your money on them might not be a bad idea as we’ve seen shocking results at this stage of the competition! Bidvest Wits continue to ride the crest of the Premier Soccer League wave despite dropping points in recent weeks. They have drawn one and lost one of their last two games. Red, hot Gift Motupa scored a brace in a thrilling 3-3 draw against Polokwane City last week, while Deon Hotto continues to provide assists for fun. Despite having a great run in the Nedbank Cup qualifiers, Boyne Tigers lie 10th on the ABC Motsepe League Limpopo stream with two games in hand and nine points off the pace. They’d welcome elimination to focus on trying to regain promotion. Wits are too short at 1/33 but that’s the only market so take it. Cape Umoya United are unbeaten since Dominic Isaacs took over the coaching reins with a record of three draws and two wins. Last week, they manged to hold second-placed Mbombela United to a goalless draw. The Tshwane University of Technology football club sealed Nedbank Cup qualification through beating highly-rated ABC Motsepe League side, Dondol Stars. TUT are also the current South African Varsity Football champions. This could be a banana skin for the NFD side against a highly-motivated and youthful side hence I’m backing the away team. AmaZulu are looking to return to winning ways after suffering their first defeat at home when they lost 3-2 to Kaizer Chiefs last week. On the other hand, Highlands Park come into this one off the back of three successive draws which took their unbeaten run to six games. It’s hard to beat the Lions of the North therefore I’m going to back them to triumph here. Chippa United’s league form has been poor with only three wins in 18 games. One of those victories came last week in coach Clinton Larsen’s first match in charge of the side against bottom-placed Maritzburg United. The Chilli Boys really need to focus on surviving relegation and they might field a weakened side. Despite crashing out of both the MTN8 and Telkom Knockout earlier this season, Sundowns remain the only unbeaten team in the elite league this season. The Brazilians have won most of their games by a one-goal margin and I’m expecting nothing different this time around. Get on a Sundowns straight win. Free State Stars have lost 10 of their 18 league games this season and last week they were thrashed 5-0 by Cape Town City. Sbusiso Hlubi who got sent off in that clash won’t be available for selection due to suspension. Richards Bay have been inconsistent this season and they lie seventh on the NFD standings with a record of five defeats, six wins and seven draws. I’ll go for a draw here. Umvoti have won three of their last five games in the ABC Motsepe League’s KwaZulu-Natal stream. This season hasn’t been great for them as they look out of the promotion race. The death of coach Bheka Phakathi seems to have affected them negatively. Dan Malesela’s TS Galaxy have lost just once in the last six matches and they managed to win three of those. There might be a difference in class but this will be a daunting trip to an in form KZN side. This should end in a draw. Black Leopards are unbeaten in the last five league games and coach Dylan Kerr seems to have turned the team around since taking over the hot seat. The well-respected mentor is famously known for winning back-to-back league titles with Gor Mahia in Kenya. 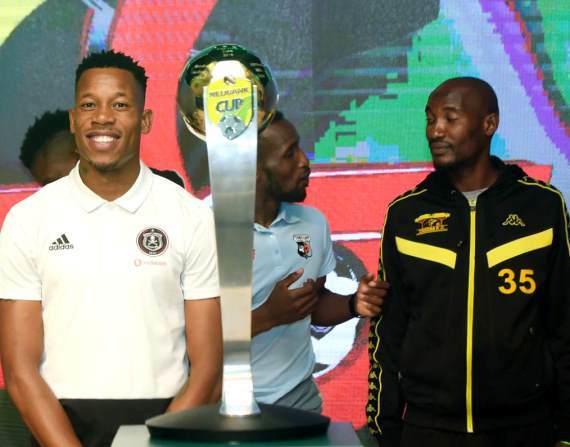 Orlando Pirates are unbeaten in the league since gameweek four and they seek redemption after losing the Telkom Knockout final in December. They were brilliant in the CAF Champions League last week where they thrashed FC Platinum 3-0. Pirates are banker at 11/10 and I’m taking it. These side have met in three cup finals over the last three years with Cape Town City winning two of them. Benni McCarthy’s charges head into this rivalrous clash off the back of an emboldening 5-0 triumph over Free State Stars. SuperSport United snapped a three-match unbeaten run last week with Bradley Grobler marking his first start after a lengthy injury lay off with a goal in the 2-1 win over Bloemfontein Celtic. The home side should be able to edge this one. Tjakastad Junior Shepherd have lost only three of their 17 games so far this season and they lie second on the log. They face a revived Arrows side under the tutelage of Steve Komphela who is yet to lose a game as their coach. Back the PSL side to win away from home. PSL promotion-chasing Mbombela are second on the NFD log and have been superb in recent weeks. They have won three and drawn one of their last five games. The defeat they suffered in that run was against rejuvenated Ajax Cape Town. They should be able to see out a SAB League (fourth tier) side. Mbombela are overwhelming favourites for victory at 1/6. Super Eagles who were relegated from the NFD last season are priced up as underdogs at home against a Bloemfontein Celtic side who are enduring a turbulent season. The indifferent start has seen Phunya Sele Sele win seven and lose seven of their opening 18 PSL fixtures but they should be able to get the better of an ABC Motsepe League side. Celtic are a banker at 7/20. Tornado are second on the Eastern Cape stream of ABC Motsepe League and they will relish an opportunity to measure themselves against the country’s most popular team. Kaizer Chiefs have crashed out of the CAF Confederations Cup after losing 5-2 to ZESCO United on aggregate and that will give them enough time to focus on domestic competitions. Back a convincing Amakhosi win here. Shakes Mashaba won two of his first three matches in charge of Witbank Spurs which includes a 4-1 annihilation of Real Kings this past weekend. On the other hand, Maritzburg United anchor the PSL table and head into this one off the back of six consecutive defeats. In fact, the Team of Choice has won only one game this season. Shakes Mashaba is likely to register his third win on the bounce here. Since winning the Telkom Knockout in December, Baroka have played five league matches and have only won one of those. Bakgaga face off with a Jomo Cosmos side which is on a three-match losing streak and lies 12th on the NFD standings. I’m predicting a Baroka win. The Magic are third on the Western Cape stream of the ABC Motsepe League and they visit a Maccabi side that has lost four of their last five league matches. The hosts have parted ways with Mokete Tsotetsi and appointed Joel Masutha to save the sinking ship. I’m tipping Masutha to help them advance to the Last 16.